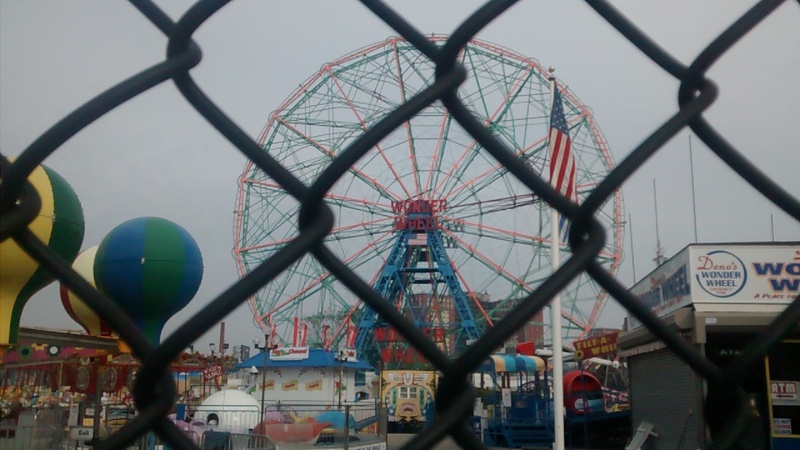 The iconic Wonder Wheel as seen through the fence recently along the boardwalk of Coney Island, Brooklyn, New York. Coney Island’s rides stood in a dream-like state as I walked the boardwalk that morning. I overheard Russian, Japanese and Hispanic conversations. Seagulls outnumbered the people. Barges powered past. The rides behind the fences reminded me of the 10 traveling carnivals I worked in the last year, as if it was a past life. The Wonder Wheel reminded me of the “Cheese Wheel,” as they call the Kraft-sponsored Giant Wheel at the Oklahoma State Fair in Oklahoma City. The Cyclone reminded me of the Windstorm at the State Fair of Texas. The Wonder Wheel and the Cheese Wheel, the Cyclone and the Windstorm may remind me each other but they are from different sides of the tracks. The Cyclone is a wooden rollercoaster dating back to 1927. The Windstorm is an iron rollercoaster but even it was replaced at the 2013 Minnesota State Fair by the Rip Tide (which I filmed for “Wild, Wild, West Crew” on YouTube). The Wonder Wheel dates back to 1918 and is a 150-feet-tall with 24 cars, each seating six people. The Cheese Wheel is 90-feet-tall, with 20 gondolas, seating six-to-eight people. The 212-foot-high Texas Star which whirled behind me as I worked games at the State Fair of Texas was the tallest “Ferris” wheel in the country. This year the 520-foot High Roller in Las Vegas became the tallest but the New York Wheel is being planned for Staten Island and may be 625-feet-tall, with 1,440 people per ride. The original “Ferris Wheel” was built by George Washington Gale Ferris Jr. for the 1893 World’s Columbian Exposition in Chicago. It was a monster in its time, at 264-feet-tall and holding a capacity of 2,160 people. However, those mega-sized permanent, observation wheels at amusement parks are different creatures. In the traveling carnivals, professional carnies know how to set-up and tear-down rides so fast they seem to vanish in the night. In California, the Butler Amusement carnies setting up the Giant Wheel were Mexicans from the small Veracruz town of Tlapacoyan. They never wanted to work with any locals, claiming locals slowed them down. In Chicago, Alaska and Georgia the carnivals I worked in each used a mix of traveling carnies and young local men to set up Giant Wheels, Eli Wheels, Century Wheels and combinations of each wheel. I ran the controls of a Gondola Century Wheel in Anchorage and Fairbanks, Alaska in 2013. My last carnival work was earlier this year. 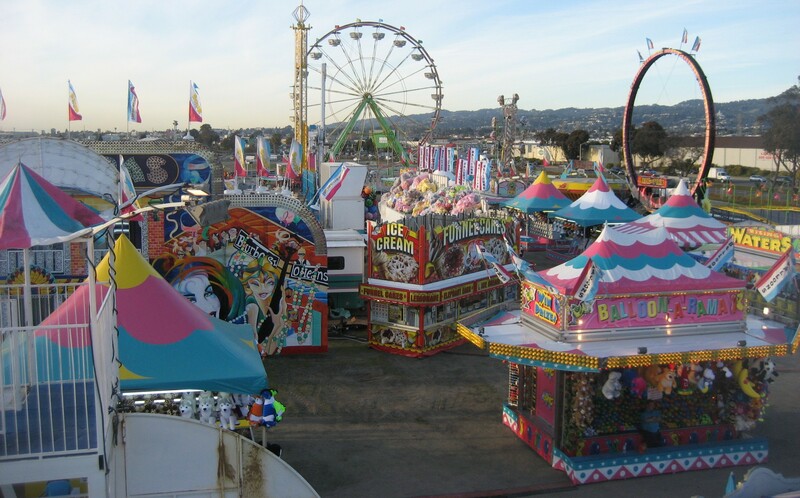 It’s off-season now for both traveling carnivals and amusement parks. Traveling carnivals moved to what are called “winters quarters” for repairs and new coats of paint. By late winter, early spring, even the old rides will sparkle. The comparison isn’t all new versus old. Coney Island’s rides may be older and permanent but traveling carnivals have traditions that date back as far. Comparisons can be made. Be the rides permanent or traveling, old or new, this time of year, they are all beautiful when they sleep. Michael Sean Comerford spent a year working in carnivals in California, New Jersey, New York, Chicago, Alaska, Minnesota, Oklahoma, Texas, Georgia and Florida. He lived on carnival wages and hitchhiked about 20,000 miles between jobs. At this time last year, he visited Tlapacoyan, Mexico, a town that each year empties out of men going to work American carnivals. Having worked both games and rides, he’s now writing a book on the experience.